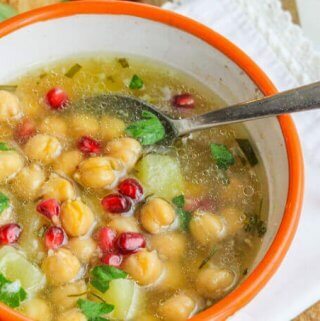 Greek Chickpea Soup (‘Revithosoupa’) is a traditional Greek vegan soup that uses simple ingredients. 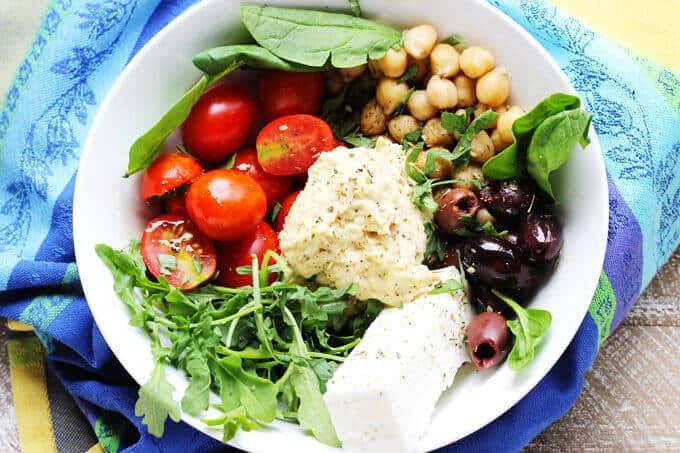 This version uses canned chickpeas and is ready in 20 minutes. 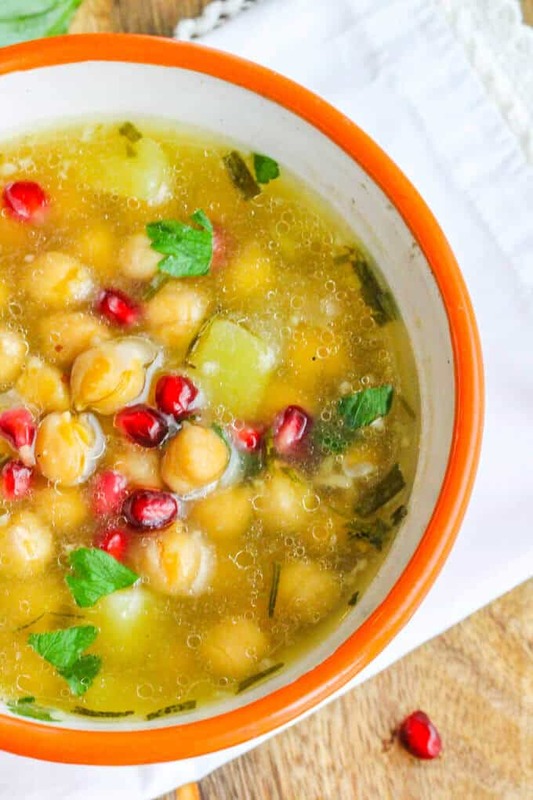 Greek Chickpea Soup is also known as ‘Revithosoupa’ or ‘Revithia.’ It’s usually served during cold winter months. Trust me, I realize that we’re now in the middle of the summer here in NYC…but bear with me. I chose to recreate this soup for a rainy, unpleasant day and it served its purpose just fine – despite not being it’s traditional season. 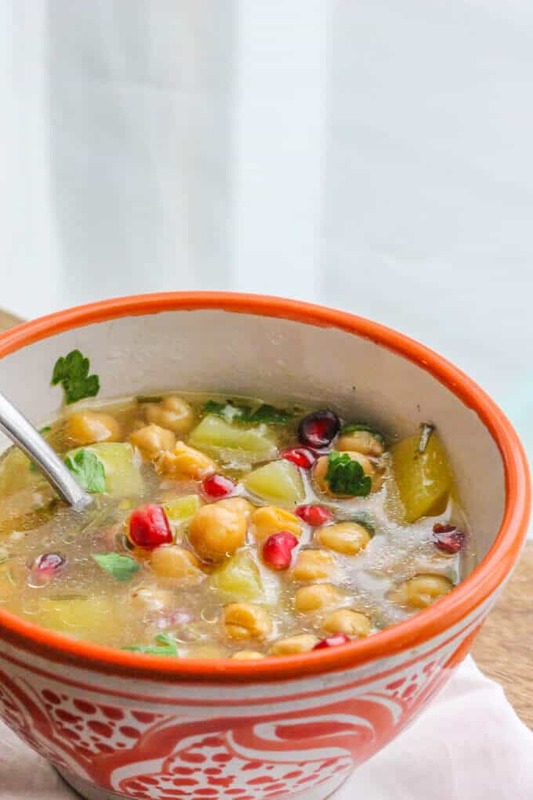 I wanted to make this Greek Chickpea Soup for the blog for a while so I thought it was a perfect opportunity. I’m not sure if you’re from the same school of thought, but I have no compunctions about having soup in the summer (especially on a rainy days) and better still if that soup is super light. This one is just 150 calories per serving! And if you can find a light soups such as this one, which manages to be filling at the same time, then you can indulge all year long. Other alternative soups which I feel serve the same purpose are this Tomatoes Red Lentil Coconut Soup or my Greek Lentil Soup. While you’re at it, I encourage you to dunk this freshly homemade crusty bread in the soup. I guess I should stop now because I’m getting hungry. If you don’t feel like making soup right now you can always save it for later, as the fall will be here soon enough. 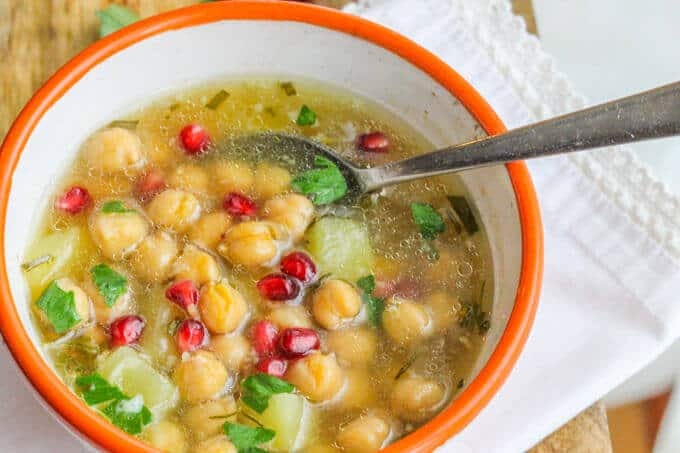 Traditionally this Greek Chickpea Soup is made with dried chickpeas that are soaked overnight and then cooked until soft. The process takes a little longer but I encourage you to go for it if you have time. 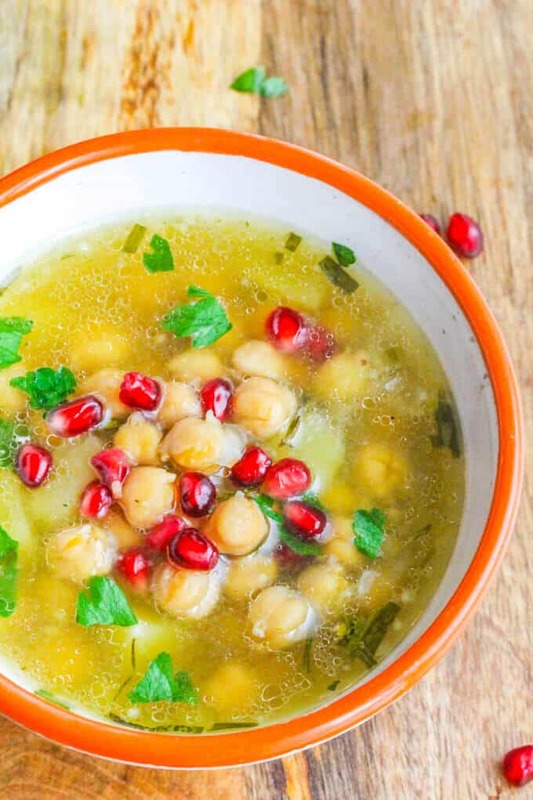 If, however, you are short on time and want to eat something quick and satisfying, canned chickpeas are a fine substitute to make this awesome soup. 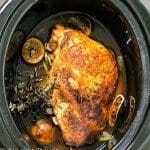 And if you feel like making a fragrant bread to accompany this soup you may also want to take a look at the recipe from Food Fanatic: Rosemary Olive Oil Bread. Add lemon juice, salt and serve with pomegranates seeds. I highly recommend it. Every recipe that I’ve ever tried making from this book seems to comes out wonderfully. In a heavy soup pot heat up olive oil and add garlic with rosemary; cook for a minute and add potatoes. Make sure not to burn the garlic. Add 4 cups of water or broth, cover and let cook for about 15 minutes, add rinsed chickpeas, cover and cook for another 5 minutes. Add salt, pepper and lemon juice. 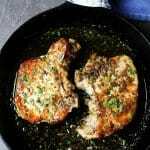 Adjust seasoning to your liking. Add more water if needed. Serve with pomegranate seeds and enjoy. 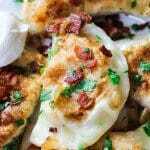 You can also go to Pinterest to see the whole gallery of my recipes. Had me at Greek! Love this soup! 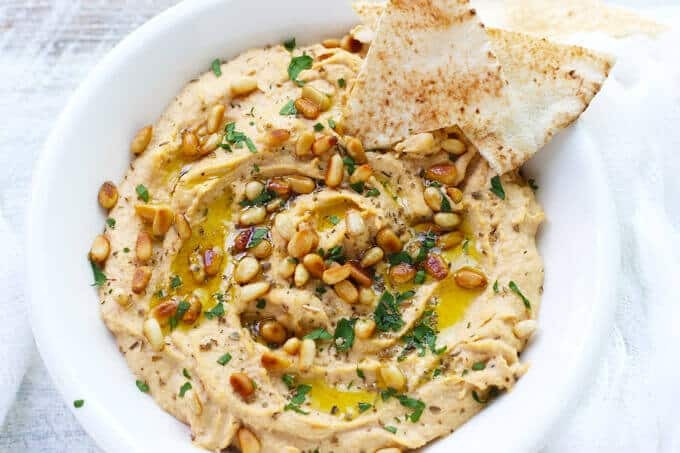 If there’s one thing I just can’t seem to get enough of, it’s chickpeas! 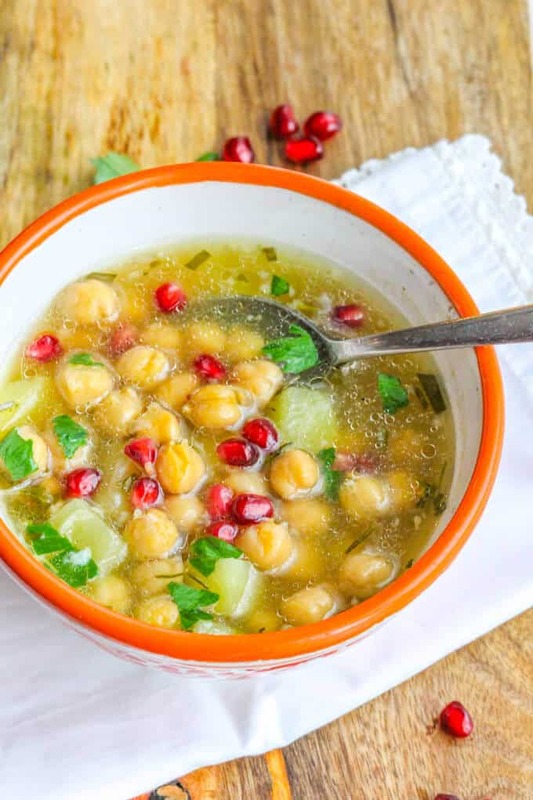 And I love the idea of pairing chickpeas and pomegranates! That must be wonderful! I can’t wait to make this soup, a local restaurant makes something similar and I can never get them to share the recipe with me. 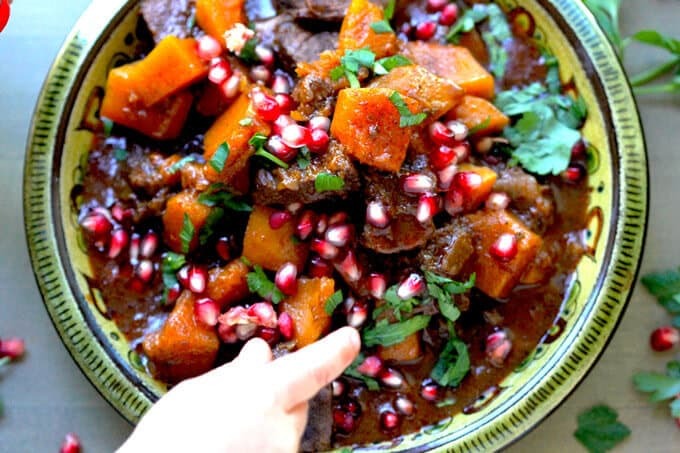 Its so flavorful, and the pomegranate seeds make such a surprise flavor booster! Pomegranates are really awesome in this recipe. Let me know if it came out similar to your local restaurant’s one. so bright and colorful! 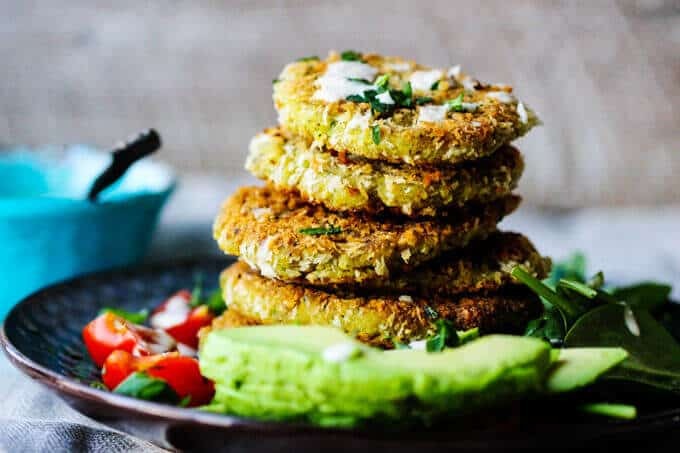 I am always looking for more ways to use my favorite chickpea, thank you!